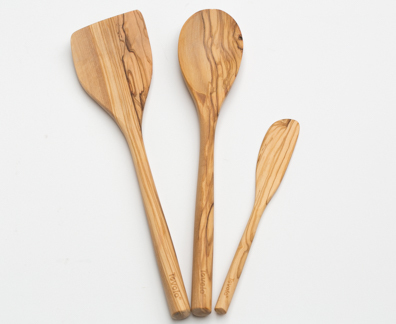 These beautiful olive wood utensils won't scratch your pans, a look beautiful besides. Use the small blade for scraping the sides of your blender (the blades will damage silicone or rubber utensils, but not these). This 3-piece set makes a great gift — extend an "olive branch!"